I think the answer is that it would still be plagiarism if the only thing Allen Murabayashi replaced was Jerry Saltz’s byline. 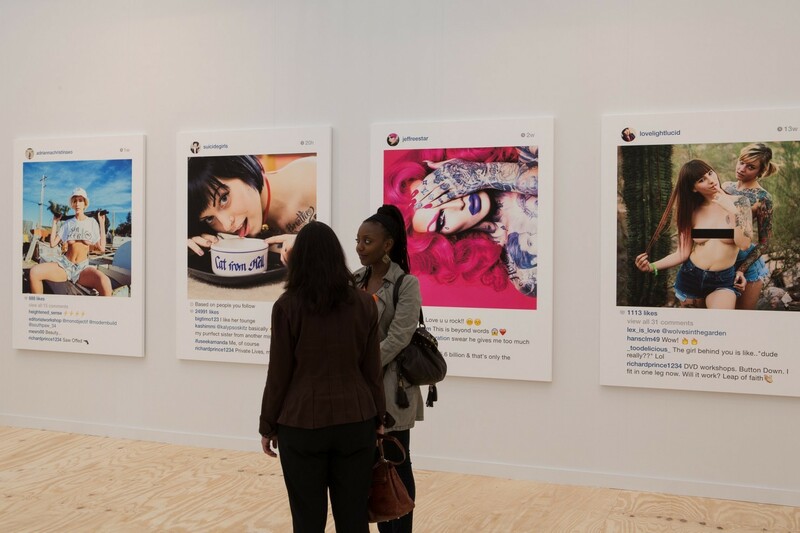 However: What if Murabayashi were to take Jerry Saltz’s text and reformat it with different calligraphy and computer fonts; in much the way Richard Prince took Instagram photographs and “transformed” them using silkscreen? Would Jerry Saltz’s text be considered sufficiently transformed that it would become Murabayashi’s to sell, for as much money as his “transformation” could attract? Or could Jerry Saltz claim that merely altering the font and “look” of the text didn’t transform the originality of his thought realized through his choice of specific words? At what point, or in which way, can one use another person’s writing, verbatim, and claim that by manipulating it visually– that is, calligraphically–the text itself has been transformed? Because that seems to be at the heart of the Prince argument and his “transformations” of other people’s images. And if I alter this remediated image of Prince’s exhibition of photographs he appropriated from Instagram, does my remediated image qualify as an original work of art? Perhaps. At the moment, however, it simply qualifies as fair use, having been published in news articles and reposted widely on the Internet. Ah yes. The old “text consists of graphemes / therefore text bears different SENSE when you change the font family/character set” argument… Okay, actually I don’t know if that’s an old argument or not, but it MIGHT be. I fall into the “Prince is a jerk” camp. It’s no different in my mind than online venues which (by intention or not) hide in their terms of service a statement to the effect that “everything you post belongs to us to use however we want.” (When caught out, such services always get all red-faced, and patch up the wording — a response which suggests that the claim is unsupportable.) Prince’s only “defense,” and a paper-thin one it is, too, must be “Well, this is art, after all.” Sure it is. I’d also note that Prince has performed a bit of ethical jiu-jitsu here. It’s tempting to “repurpose” some of his original work (which I haven’t seen, although the Murabayashi article links to it) for sale — sort of a “See how YOU like it!”/”shoe on the other foot” response. But to do so is to agree with his point, that everything is up for grabs. The only possible form of objection is thus indirect: anything DIRECT risks establishing a precedent (judicial crapshoot) or using his own tactics as if they’re legitimate. There’s SO much to resent in the world, and I resent people who add to the pile while in effect jeering. (And, I might add, I resent the people who cheer those people on, as Saltz seems to be doing.) And yet, resentment (like jealousy etc.) is unproductive; it bleeds into and poisons other stuff in life. So I prefer to just seethe in short bursts, when news like this breaks — and then put it behind me ASAP. Although I want to reflect on your thoughts more carefully when I have a moment to read them more carefully, seeing the opening sentence again (I just came here to remove a spam comment on a different post), I’m reminded of the time I wrote a thesis paper in undergrad, where I used letters with different “fonts,” cut from newspapers and signs, to get across a certain “visual” aspect of the words I was using, in an attempt to convey whatever my ideas were at the time. I don’t know if a case could really be argued as I have presented it, but I don’t see why “transformation” shouldn’t apply to text as well as to image…especially if an image paints a thousand words and therefore subject to greater examination of fair use or “transformation” than, say, a three-hundred word text whose graphemes have been altered.